E5 喪失／Ver. ピアノ - Dispossession / Piano Ver. Like everyone else, my set is flawless. My only complaint is that it couldn't feature every track. I love this game and this soundtrack so much I would have gladly paid even more for another record or two in the set to fill out the tracklist more. Such a good collection and amazing packaging. Whatever company was in charge of pressing these records did a phenomenal job. The original artwork by the original creator for the set is an awesome touch. My one and only complaint is that the NieR Automata set doesn't have "Possessed by a Disease", which is also best known as the trailer song for Automata. Such an incredible set. I can't echo everyone's sentiments enough. Mine is virtually flawless with the occasional pop here and there, but it's nothing that detracts from the experience. The only downside is that it's impossible to please everyone with there being omissions in the song selection for both soundtracks. I'm guessing the English version of Weight of the World is more recognizable than the End of YoRHa version, but still would've been nice to see that one on here. The packaging and presentation are perfect with the beautiful box and original artwork housing these records. Speaking of which, I can't tell you how happy I am to see these soundtracks pressed on black vinyl instead of some hokey color/splatter nonsense. A wondrous collection for two of the most memorable video game soundtracks ever recorded. This will be discussed more on the packaging and content than it is about the pressing of the LPs, which overall are great. They're virtually quiet on all sides, with few crackles here and there preventing the whole set to be called perfect. Still, kudos to the Japanese pressing plant who made these records. The box is alarmingly thin, with the depth being almost half an inch, yet it's sturdy all around. The size didn't compress the two LPs contained in the box. Each gatefold sleeve is matte, and their texture is not only pleasant to the touch, the material avoids fingerprints so they always look nice on a light surface. 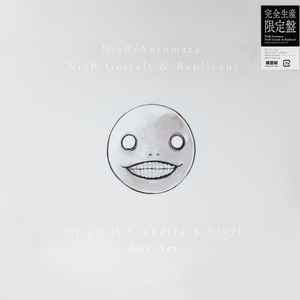 Curiously, the NieR Gestalt & Replicant LP opens from the left instead of the right which is common for the majority of record jackets, including the NieR: Automata LP. The inner sleeves are clear plastics, ones that you normally see being sold in record shops, and frankly too flimsy to be reliable sturdy; whenever I take one off the jacket and put it back in, the sleeve always crumbles. People say it's the best material to protect vinyl, but I'm more comfortable with polylined sleeves, even if they can be too thick to snugly slip 'em in an album cover. But transparent sleeves aside, I'm impressed with the packaging. Kudos to Square-Enix in providing a resealable wrapping for the box, so it'll always look nice. As for the track lists for each soundtrack, not everyone's gonna be happy with what made it in the double-LPs. Personally, Automata's soundtrack is generally fantastic all around that, even with the omission of "The Tower", "Fortress of [SPOILERS]", and "Forest Kingdom", what made it in is largely well-regarded. From the Tekken-driven "End of the Unknown" to the somberly-reflexive "Vague Hope" to the epic combat-fueled "Birth of a Wish", it's very easy to settle with what's there. With the Gestalt & Replicant soundtrack, however, the soundtrack selection could've been better. There are two Emil songs, one of which could've been easily replaced by songs worthy of inclusion like "City of Commerce", "His Dream", and ESPECIALLY "The Ultimate Weapon". Why would this LP not include "The Ultimate Weapon"? That omission still hurts me. I'm also not on-board with the versions of "Yonah" and "Dispossession" picked. But personal biases aside, at least the desert dungeon themes representing "Gods Bound by Rules" and "Temple of Drifting Sands" are intact, which I think is one of this soundtrack's highlights. Part of me suspect that S-E pressed more units of this set than anticipated, which may hurt the value of itself in the long run. Frankly, if more people have the chance to own this set, that's fine with me. It deserves to be part of any willing player's record collection. Such a stunning pressing quality for all of the 4 records. I'm totally impressed - and guessing by the font style of the runout matrix Toyokasei plant did a great job again. The whole artwork is amazingly beautiful as well. You can't go wrong with this one. This box set is readily available online now, so don't pay the inevitable flipper prices here. Amazon Japan ships worldwide and with shipping included was the cheapest option for me. But prices might go up and down on that one, though.